It looks like it’s go big or go home this Hanukkah when it comes to menorahs. It’s not even time yet to kindle the flames and already two excellent examples of what could turn out to be a huge trend have come to light. 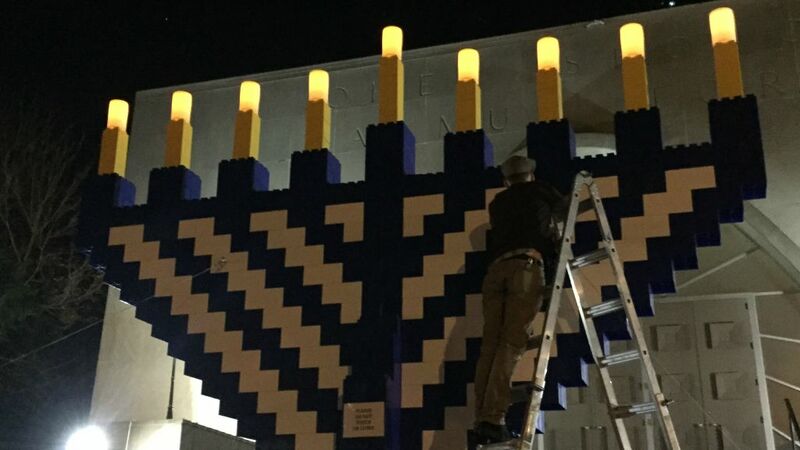 First, a massive menorah has shown up in front of Ohev Sholom: The National Synagogue in Washington, DC, well ahead of the first night of Hanukkah on December 6. 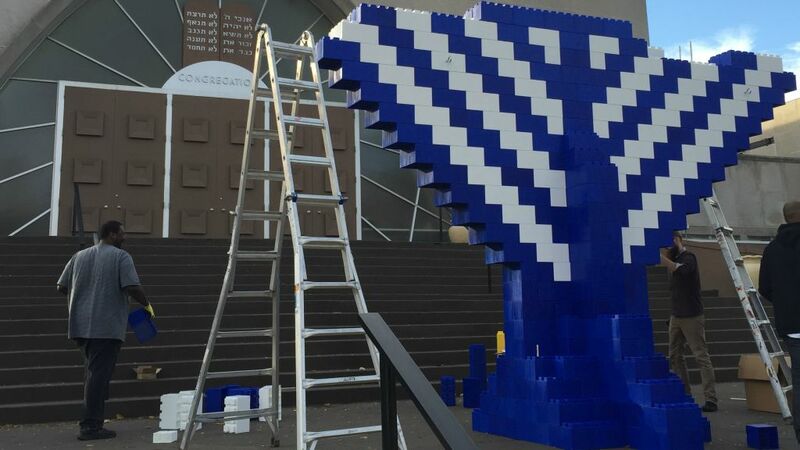 The candelabra is 17 feet wide by 17 feet tall, and it was installed by EverBlock Systems, a New York-based manufacturer of oversized modular building blocks. Usually the blocks are used to build objects like benches, desks and counters. 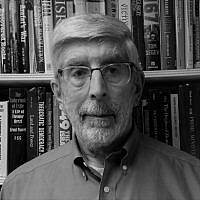 But this time the synagogue’s rabbi had a different idea in mind. 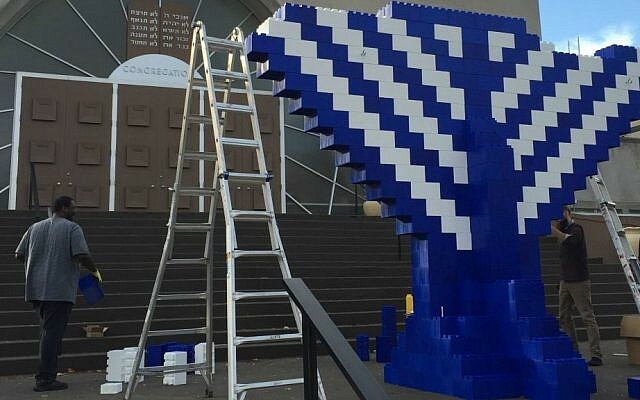 According to EverBlock Systems president and CEO Arnon Rosan, Rabbi Shmuel Herzfeld contacted him and asked him to build and install the menorah, which appears as though it has been put together out of humongous blue and white Lego bricks. 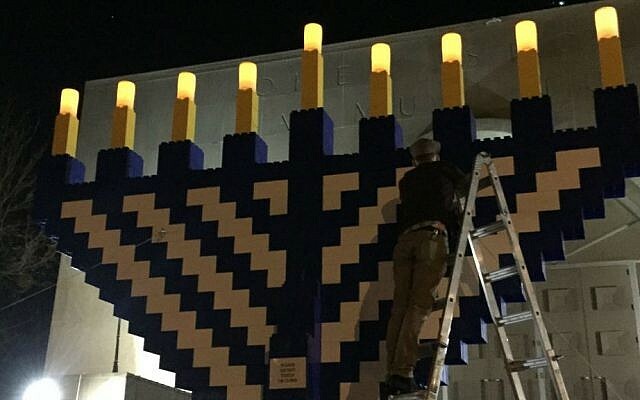 “The rabbi wanted to promote the Jewish holiday of Hanukkah in a very visible way and one that appealed to both congregants and the people that pass the synagogue every day on 16th Street,” Rosan said. “The idea of oversized modular plastic blocks was very appealing to him because he really wanted both adults and kids to connect with the project in a fun way,” he added. To prevent the structure from toppling over onto bystanders and gawkers, a series of modified blocks with eyebolts were created to allow the structure to be reinforced at four anchoring points with aircraft cables that were fastened to fixed structures at the site. The oversize candles are of the off-the-shelf LED variety and are controlled with a wireless remote. If you’re the type to think that bigger is always better but you don’t happen to have huge modular blocks on hand, don’t despair. You don’t really need an inanimate material to build a menorah. Human beings will do just fine. Just ask the 309 individuals from southern New Jersey who gathered outdoors in Cherry Hill in mid-October to form the largest human menorah (who even knew that was a thing?). They think they’ve clinched the Guinness World Record—they’re just waiting for confirmation. Big or small, what does it matter? The important thing is that you can light it up, right? So why not just kick back, mellow out and enjoy the Bong Menorah while wearing some new groovy dreidl leggings. And remember beforehand to procure some jelly donuts and to fry up a batch of latkes to satisfy the munchies.